When you ask most Vernonia area residents for their favorite recreational activity you will hear something about the forest. Hunting is a big deal in this small town and on opening day you can be sure to see a parade of successful hunters parading down Bridge Street, proudly showing off their trophy from the back of their 4×4 trucks. Located at the border of two ODFW hunting units, Scappoose and Saddle Mountain, Vernonia has a lot to offer for both the serious and casual hunters. Vernonia is home to 3 public campgrounds, one with facilities for RVs, and there are several county and state parks within easy driving distance. The state forest system in nearby Clatsop County permits backcountry camping. 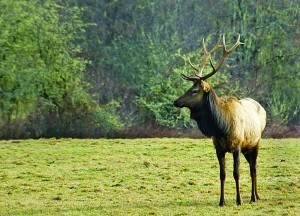 Elk and deer are the biggest draws for local hunters. The Saddle Mountain unit is tag controlled for elk (1320 tags for each of two seasons) and hunters generally enjoy better than a 15% success rate. 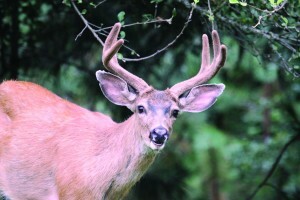 The Scappoose side is open to all hunters that buy a tag, but expect company on this “spike or better” management unit. It plays host to many Portland area hunters that fail to draw their eastern Oregon tag. The coastal jungle can be daunting to the new hunter but there are some local tricks and tips that can help increase your chances of the big score. First, be odor neutral. That means clothing, snacks and beverages. Next, be ready to cover ground. There are plenty of logging roads in the area, and the best hunting is usually behind closed gates. Bring a GPS and a mountain bike and get ready to glass some clearcuts. There are thousands of elk in the area, spread across thousands of acres of land, mostly in young forest that is very difficult to hunt. Early season scouting will go a long way toward success. Blacktail deer are a whole different challenge to even the most experienced hunter. General season tagged, like most areas on the coast, the easily hunted areas contain does and a few spikes. The 4 point and better bucks are rarely seen because they live where people dare not tread. If you dare hunt, prepare to spend all day in the woods. Prepare by using google maps to find likely territory that is behind locked gates, and get practiced on your mountain bike. Consider purchasing a trailer for carrying game. The basic rules are simple to remember and difficult to execute. Hunt when the rain is blowing sideways, and keep your binoculars dry. Scout the pre-season for established game trails that lead to water and figure out how to get above the thickets so you can see the bedding areas. Move slower than slow and spend more time looking for deer than thinking about other things. Travel only when it’s too dark to shoot. Hunting deer and elk in the rugged coastal forests is a test of endurance and skill. Some punch their tags every year, and some eat tag soup. While you are in Vernonia on a scouting trip, make sure to stop by the True Value store for hunting and shooting gear, and ask for some tips. The store owners have been hunting the area for decades, and the mounts on the walls prove it.